Some people claim that it’s difficult to grow orchids. I would never have attempted it, even though I do have a “green thumb”, a trait I inherited from my grandfather and his son, my father. This plant was given to us at the funeral home after our daughter, Justine was killed in a car accident nearly 2 years ago. It was in full bloom when we got it but I really didn’t believe there was much hope for it. To my huge surprise and joy it bloomed last winter and today I found this gorgeous flower. It had reached into the blinds and was blooming out of sight. Orchids really are one of the prettiest flowers. I agree. They’re so delicate. Thank you. I do feel Justine is helping it bloom. All I do is water it very occasionally. It does seem that’s so. A mystical connection. Thanks. Big surprise for me today. 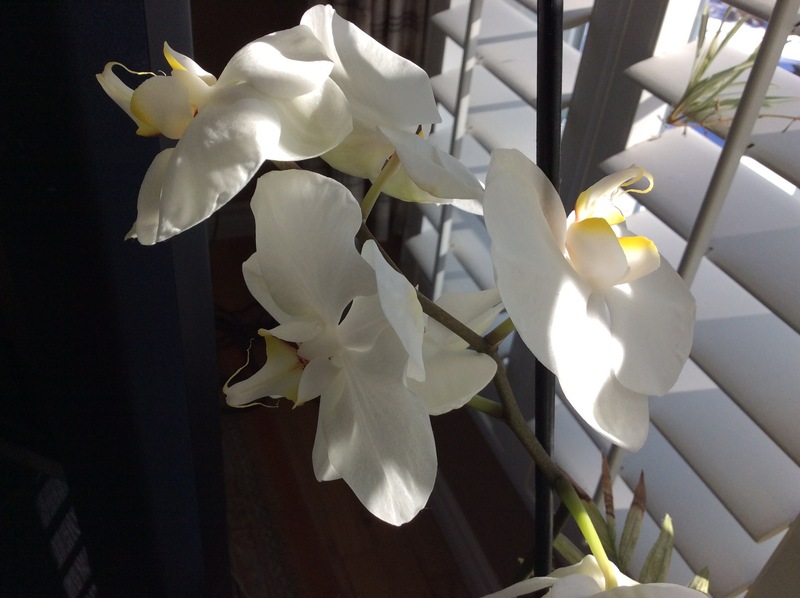 I am so sorry about your loss- and justine’s orchid is so darn cool! Side note – I went with me son for him to get his driver’s license – our county makes all new teen drivers sit before a judge to watch videos about distraction and not drinking and driving and all that- and near the end the judge asked does anyone have anything and I shared about a girl I met in 1995! A teen who would later be killed in an accident and I had the last live video recording of her because I met her and her family at a fireworks display and invited them over for lunch – God appointment for sure – I still keep in touch with the mom – and well – I told the teens to remember shanna when they get behind the wheel – and later the judge asked me for the letter from her mom and now they might add her story into the sessions they offer! I was floored! Anyhow – sending you a heart and again – sorry about your loss! I’m sure of it! Thank you! Beautiful flower. Your daughter must be very happy for you and wanted to put a smile to your face, no matter if she’s here or not. It’s a blessing, cathy.